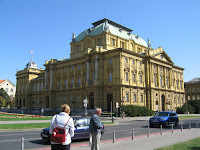 (Day 9) Zagreb was the surprising city of the trip. It greatly surpassed my original expectations of the city. 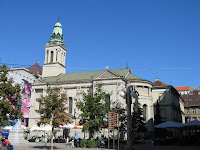 I originally had low expectations for Zagreb for a couple reasons... Our trip to Zagreb was set for a Sunday. Sundays in Western Europe usually involved everything being closed and people staying at home. In addition, we’d found the in-land cities to be more industrial and not tourist friendly. And I was tired from all the traveling. Upon arrival, we found a cute Italian restaurant in the basement of a random building in old town. This was obviously the place to be as it appeared many groups had spent their entire evening there, based on the bottles of wine. Sunday was spent taking a foot walking tour through the many, pretty old buildings and monuments. The best part was visiting all the parks that Zagreb is known for. Each park in this city has a different theme: old English park with walking trails, lake & tea garden, botanical gardens full of unique flowers, and manicured parks. This town is so dog friendly - we even saw a guy taking a posing his dog in front of a fountain, taking a pic, then rewarding the dog (pic below). 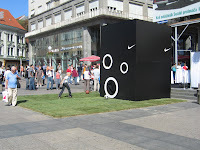 There was a "Nike" festival happening in town when we were there to celebrate the opening of the new store. 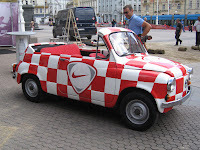 They were raffling off this cute little Nike car. I was hoping to win the contest, but soon realized I had no chance - especially compared to the 10 yr olds who were much better able to kick the ball in all the holes. Even better, we found the best ice cream place of the entire trip in Zagreb. 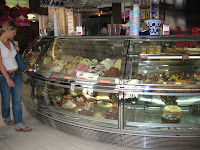 Ice cream is everywhere in Croatia, or appears to based on the number of ice cream parlors. Zagreb had the best!